David Allen, the creator and master of the time management system Getting Things Done (GTD) provides regular updates on how to get the best from his time management system. Direction is more productive than discipline. What is David saying here? Basically, he is saying make sure you do the tasks that move you in the direction you want to go. Take time to reflect and to make a choice so you are heading in the right direction. David is also suggesting that perhaps discipline and motivation are over-rated and that they come from making sure you are heading in the right direction. I agree totally with David's key point and I cover this in my Time Management Secrets in secret 2 Activity is not achievement and secret Are you in the right building? I am not so sure that there is a clear distinction between motivation, dicipline and direction. David suggests that you need to be disciplined to discipline yourself. I could argue that you need to be disciplined to stop, reflect and make the choice to move in the right direction. Most people I know that have tried GTD feel you need to be disciplined to keep using the system. Stopping or stepping back out of the day-to-day is one of the hardest things that my clients and readers tell me is the hardest thing to do. It is one of the biggest challenges for time management in the 21st century. My suggestion is to make being discipline as easy as possible for you . Use physical triggers, use other people, link the task to your values, put physical blocks in your way -- find something that helps you be disciplined. Here are some examples from my clients and readers. A big RED DOT . When I see I ask myself am I doing activity or achievement? Use interruptions as a trigger. When interrupted I check the priority of the interruption AND ask myself am I doing a high priority task right now? Have a colourful weekly plan on your desk/diary -- it catches your eye and points you in the right direction. A 4 x 6 inch laminated card in a bright colour that asks What is the best use of my time right now? Hope these help. More GTD productivity principles soon. Check out more GTD information, including a video of David Allen at our GTD page. You can find out a look more about these ideas at the site. You can start at the quick start page or click a link below. 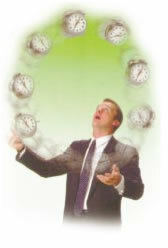 Time Management Videos -- Free video presentations on time management..